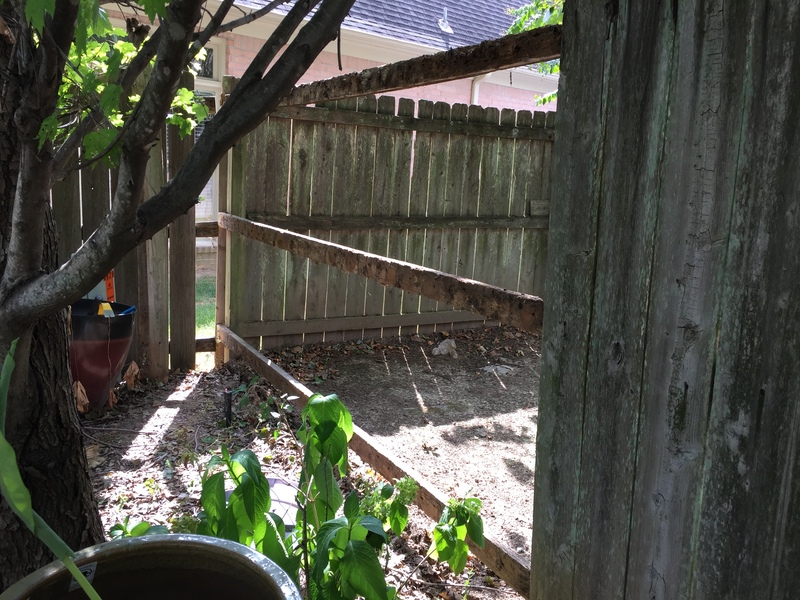 I have written before that I need to replace this fence in our backyard and last year when I retired and starting making my “To Do” lists, it was at the top of my “Long Term To Do” list. 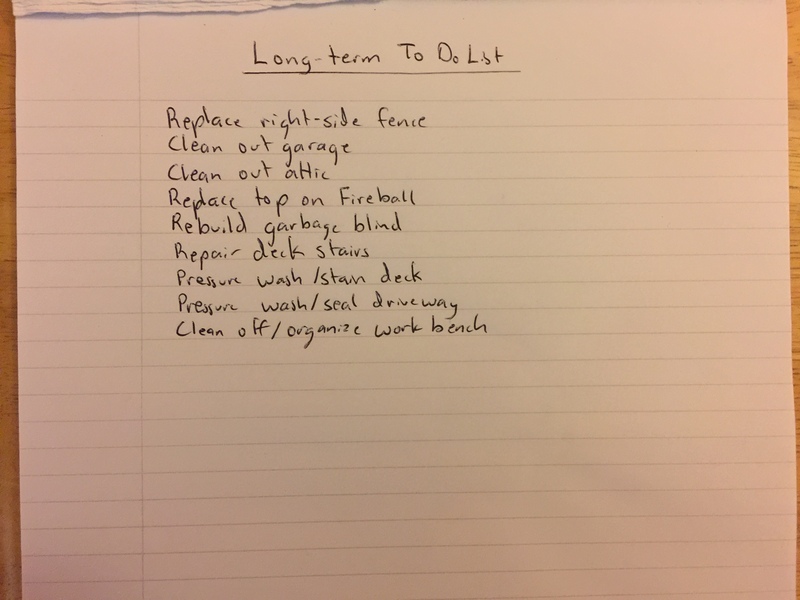 With all the travel my wife and I have had this past summer, it wasn’t until the end of August that I finally had the time to take on this task. 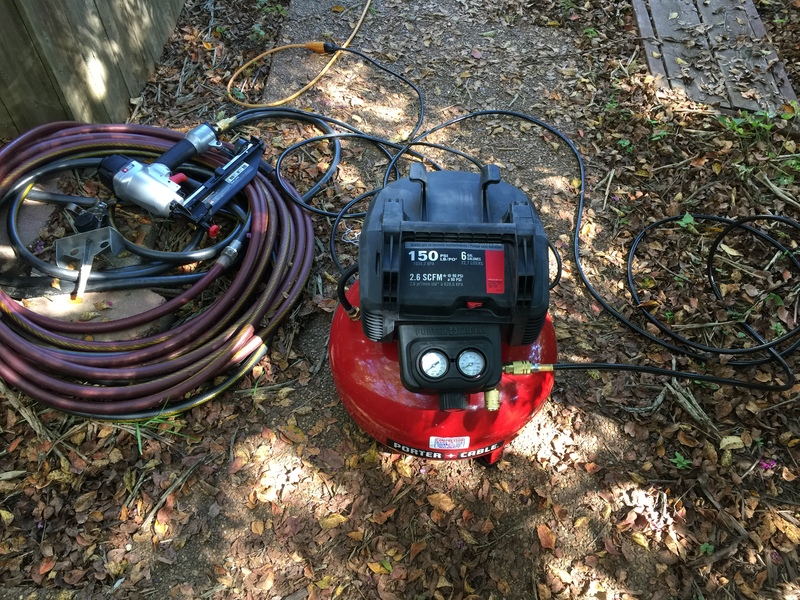 Although I knew it was a multi-day, possibly multi-week project, I was actually looking forward to working with a new tool I got last year. Just before I retired last year, I reached a 35-year work anniversary and got to select a gift for reaching this milestone. 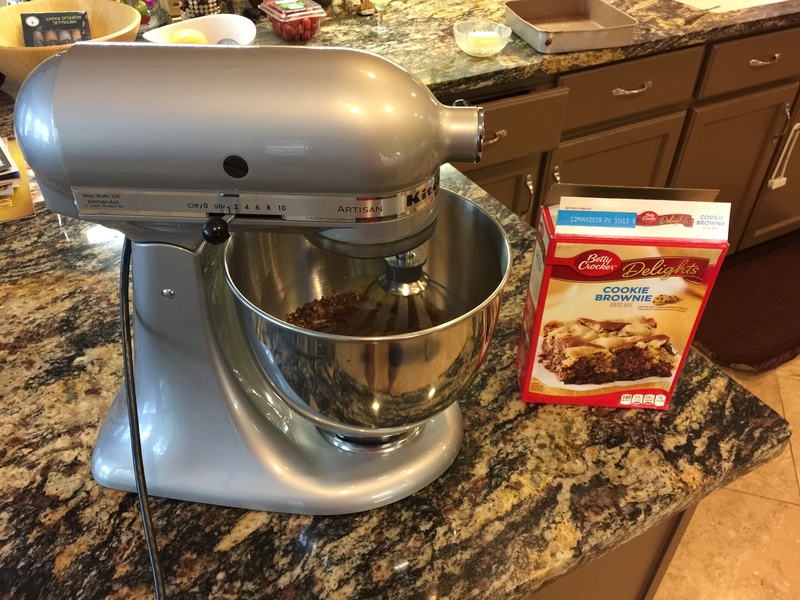 I planned to do more cooking (which hasn’t happened yet) and so selected this Kitchen Aid Mixer (which I’ve only used once to make, of all things, a box of brownies, not an auspicious start). Then when I retired a month later, I was allowed to pick another gift. Options included luggage, clocks, watches, silver and golf clubs, all items that would either celebrate the event or be put to good use with the extra time I would have. I seriously considered the golf clubs although I haven’t played in over 20 years but figured even with new clubs, I still might not play. The one odd item that stood out to me on the catalog was a compressed air nail gun. Maybe that was a popular item for New Jersey residents retiring from a pharmaceutical company who planned on starting their own construction business, but of all tools that could have been included in the catalog, that one surprised me. 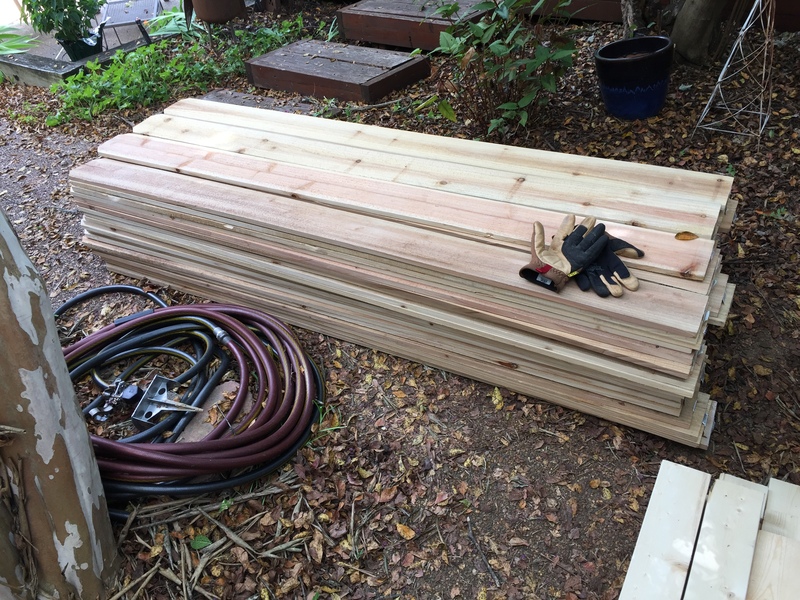 As much as I love buying new tools for a project, I never once considered buying a nail gun. But knowing that I had this fencing project looming, I selected this item. And when the time came nearly a year later to work on this project, I finally got it out of the box and taught myself how to use it. I filled up my wife’s Subaru Outback with enough materials to get started and laid everything out. 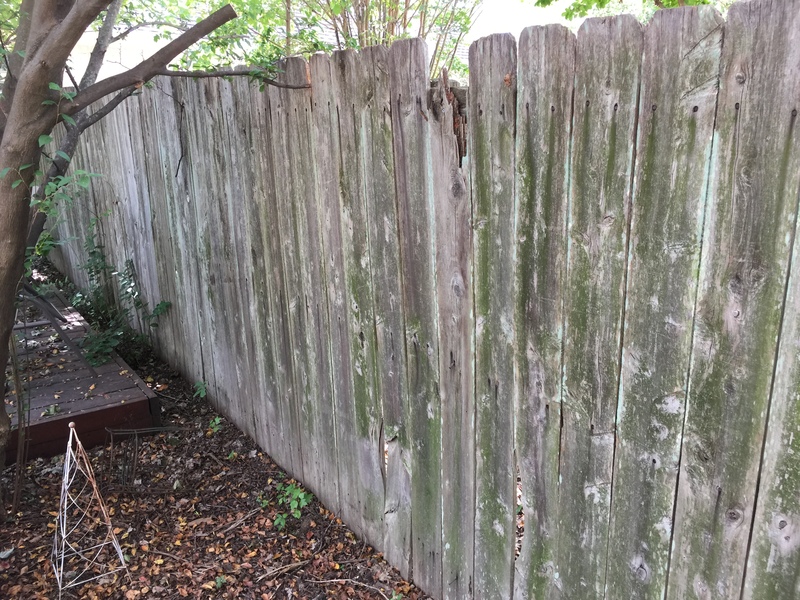 Certain sections of the fence were in terrible shape; the cedar fence boards had just not weathered very well over the 20 plus years of being in the yard. 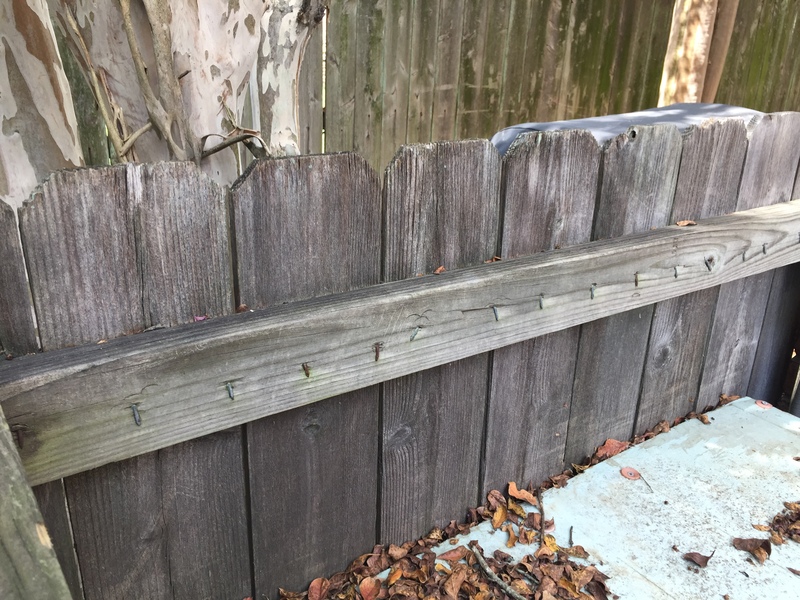 And nowhere near as well preserved as the almost 20-year old fence I built around our pool equipment using cedar fence boards and pressure treated studs. The easiest thing to do would have been to just pull the whole thing down and start all over again but since we have a pool which we have to keep secure for safety reasons, we couldn’t do that. 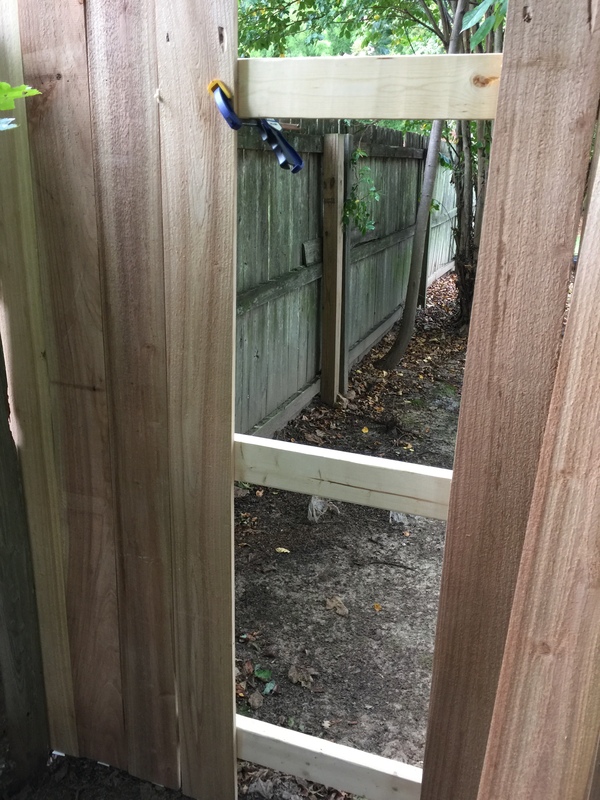 I wrote a note to our neighbor whose backyard is on the other side of the fence that I planned to replace only one section at a time so that the security of the fence would remain throughout the project (they had children and also a small dog). The fence posts, obviously pressure-treated, were for the most part in fairly good shape and so I planned to reuse those (which would save digging new holes and setting posts in concrete). I decided to start at the back corner of the yard since these boards were in the worst shape. 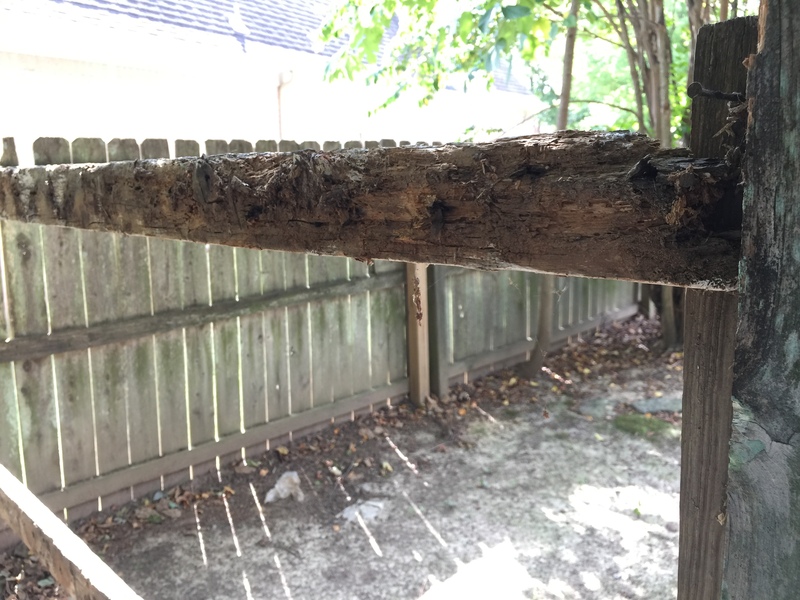 With a crow bar, I pulled the old fence boards from the cross beams with many of the boards crumbling in the process. Since the boards were so rotted, it didn’t take much effort to pull them loose until I got to where the two fences met. 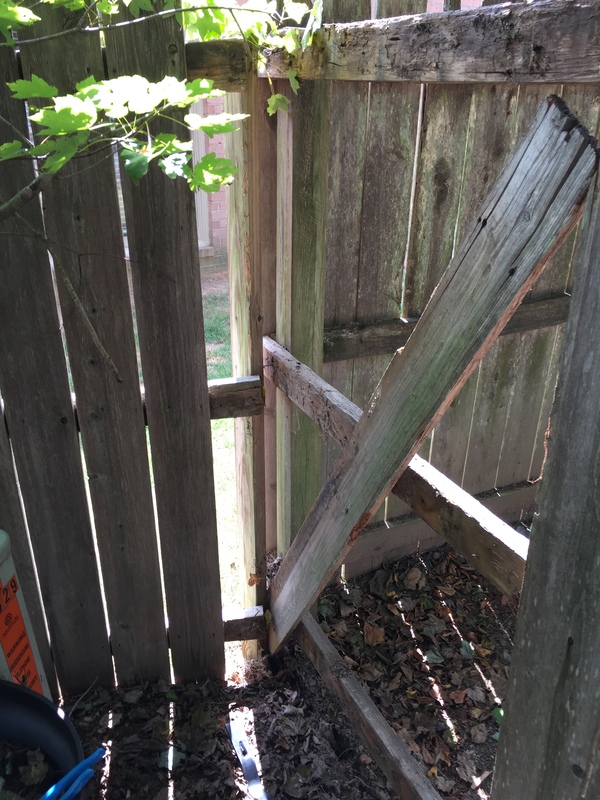 Here the back fence was nailed into the side fence (rather than into a post) so I had to wrestle with getting an entire fence section dislocated from the fence that was being replaced. And just when I got to this point with much effort, our other neighbor’s dog stuck his nose through the opening and began growling at me. Fortunately that neighbor had just come out and quickly escorted their dog back in the house. When I finally got all the boards down from the first section, I was amazed at how rotted the cross boards were. No wonder the fence had been on the verge of falling down. 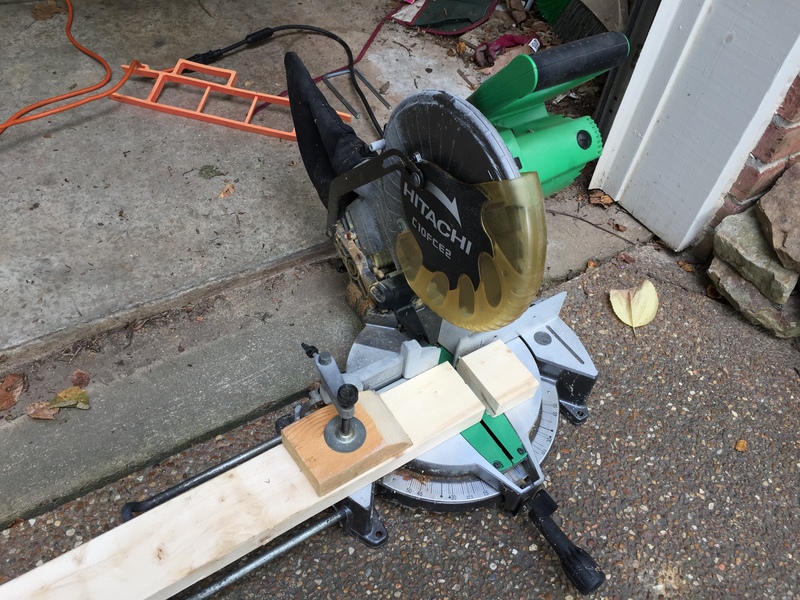 Thanks to having a miter saw (purchased for a previous project), replacing the cross beams was a fairly quick step even working alone as my clamps held the beams in place while I screwed them into the posts, after making sure each was level. 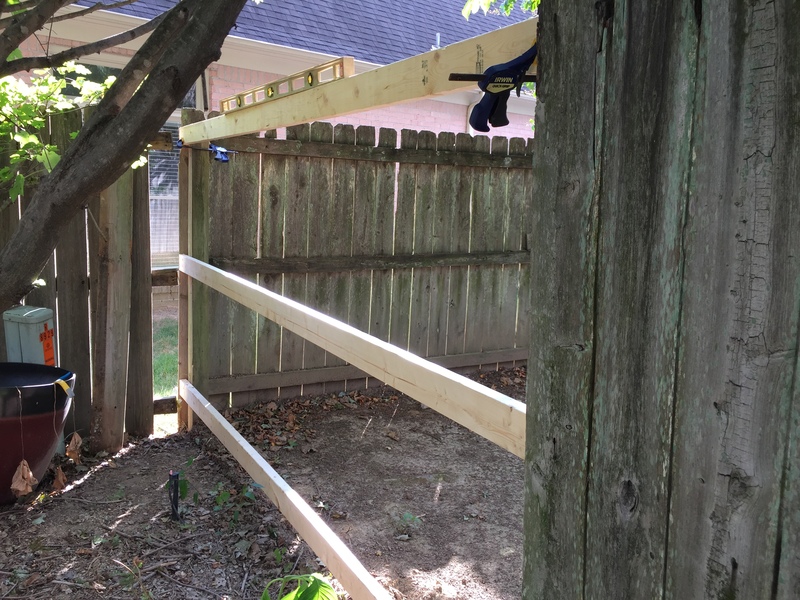 I searched online about how much gap to leave between fence boards and found quite a dispute about whether one should be left at all since the boards typically shrank over time. 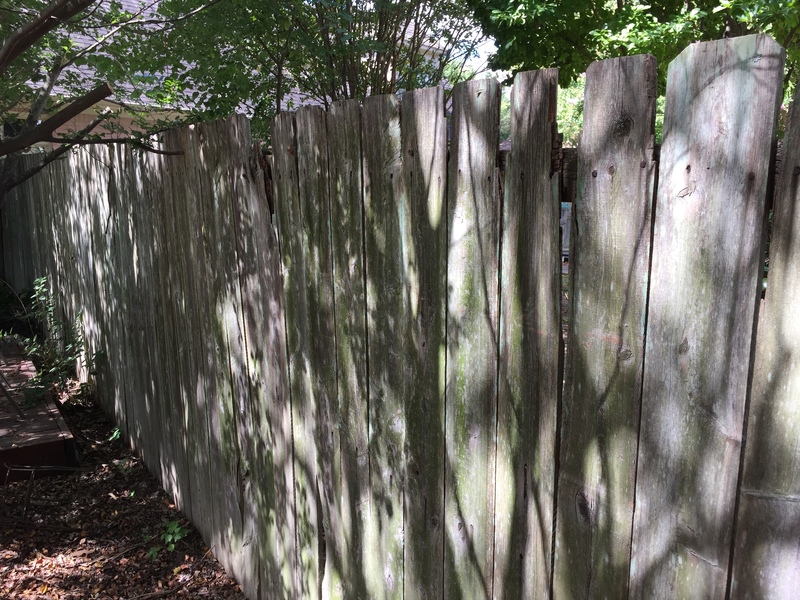 But shrinkage depended upon whether the boards had been dried or not (I read one account of someone who attached the boards temporarily to let them dry for several weeks and then removed them all and tightened them up permanently later—essentially building the fence twice). I took the conservative approach and decided to allow a 3/16-inch gap, the minimum recommended. I clamped each board to the top cross beam, added my little tile spacer, ensured the board was plumb on the side, aligned at the top with the previous board, and nailed her in. After I had put up a few boards (a section took about 20 boards), the sky began to cloud up and I could hear distant thundering. We had had very little rain during the month of August so I didn’t think too much about it and kept going—I still had 17 boards to go to reclose the open section. I don’t know how many times I tripped over the sprinkler head or bumped my head on different branches of the tree I was working under (see previous photo above), but each time I did, the thundering seemed to be getting closer. Then all of a sudden, a torrential down pour came up with thunder booming very close by. And here I was working under a tree, not a bright idea in a thunderstorm. I didn’t even know if my nail gun could get wet so I picked up everything I could and made a mad dash for the garage. I checked the radar and saw that several bands were coming through and rain would not stop until 11:00 PM so I had to give it up with just about a fourth of the boards installed. On my first day working, the fence had defeated me! 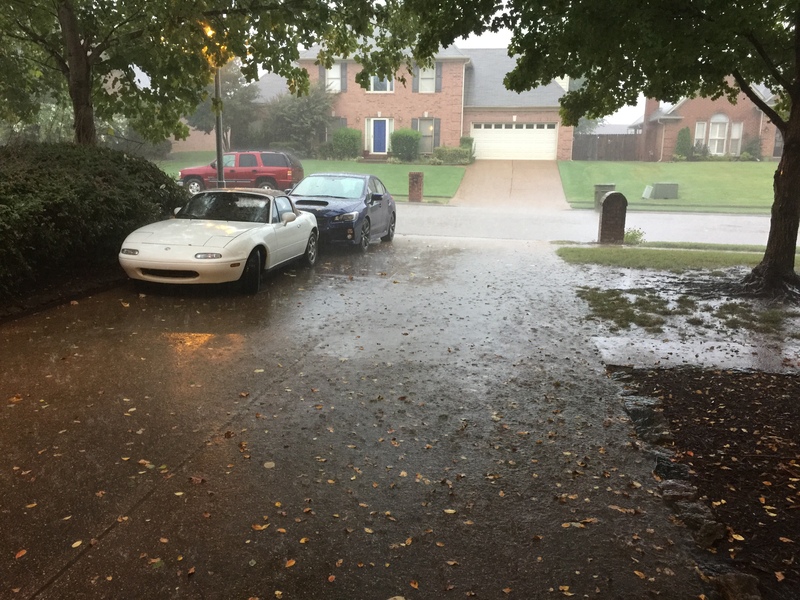 I only hoped my neighbor would understand me being rained out that day. Previous Previous post: A New Top! 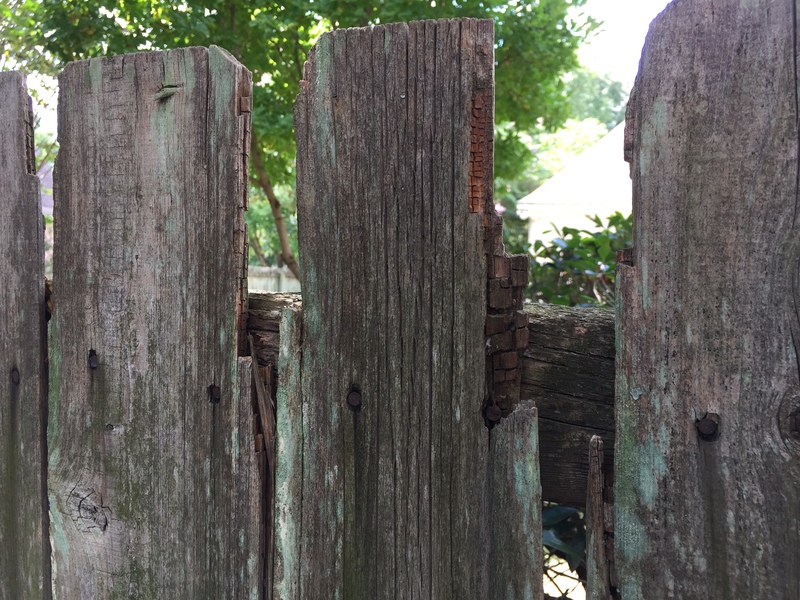 Next Next post: Re-Fence or Defense? Or Snatching Victory from Defeat? Wow, what a big job! The new boards look beautiful. Now I want a nail gun too! Heaven knows our fence has seen better days! Thanks, wait until you get to see the finished job in person. I never thought I wanted a nail gun but it has been fun to have. onecreativescientist Re-Fence or Defense? Or Defeat?